It started out innocently. On the weekend of our son’s graduation from Penn State two years ago, we moseyed around a native plant sale on the outskirts of the university. I picked up a 4-inch pot of horseradish and waved it at CRR. “Sure, let’s get one,” he said. Horseradish is a great accompaniment to a gorgeous steak. In small doses, it can liven up everything from tuna salad to mashed potatoes. Or put a little zing into mayo for almost any use. Six million gallons of the stuff are produced in the U.S. every year, clearing sinuses from coast to coast. Back to my garden. It muscled its way through one corner of the garden in Year One, and we fought off Mexican beetles that chewed its leaves into tatters. In Year Two, CRR divided it and now it conquers two corners of our garden. This year I am determined to contain its voracious root, and not let it overshadow the beets and carrots. The fight is on. 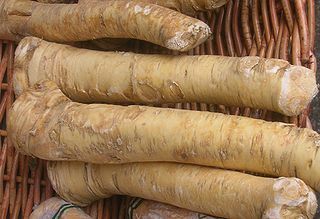 It turns out that horseradish is invasive, which I suppose I should’ve known given its aggressive punch. If you want a root, let me know. We just sent some to my sister in Alaska, and I’m betting the horseradish will withstand even Arctic winters. To prepare: Take a chunk of root, peel and cut into one-inch pieces. Whirl in food processor until desired consistency (do NOT inhale the fumes rising from the food processor, they’re dangerous). Add a little white vinegar as a preservative. Will keep refrigerated for several weeks. WordPress is pretty intuitive, just follow their directions. Yes, I created it myself.